The Informatica Workflow Manager is used to create a Workflow. A workflow is nothing but a set of instructions to execute the Mappings that we designed in the PowerCenter Designer. 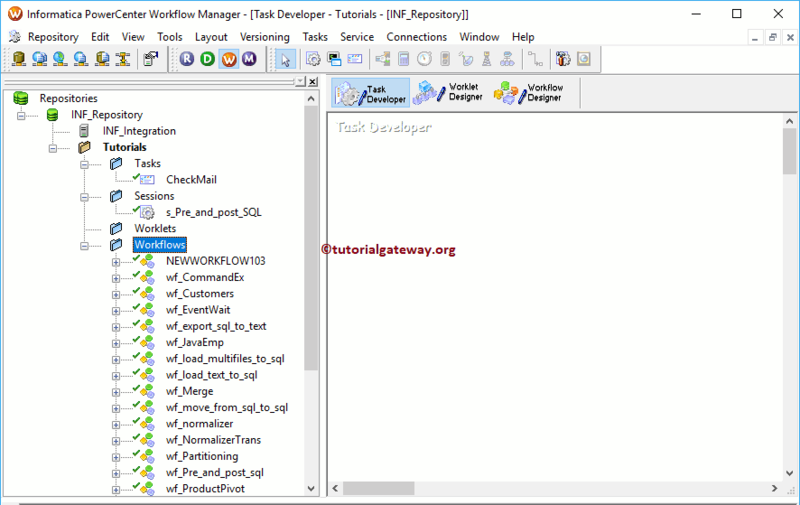 Generally, an Informatica Workflow Manager workflow contains a Session Task, Command Task, Event Wait Task, Email Task etc. It also helps you to schedule the Mappings. 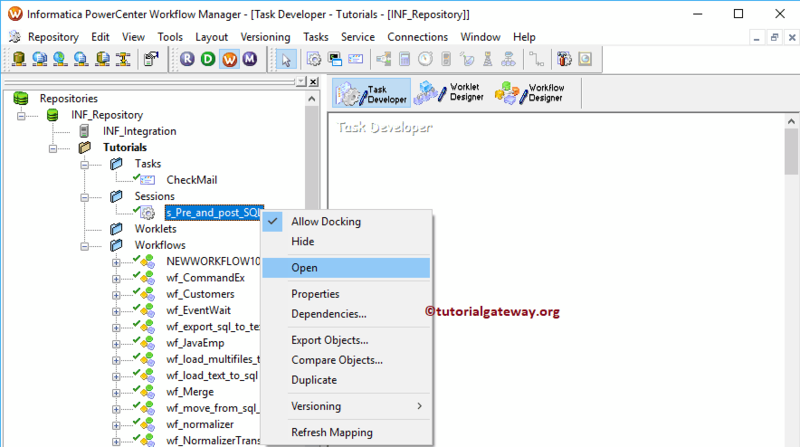 Informatica PowerCenter Workflow Manager has an import option called Worklet designer, Which is used to combine (group) one or more task to make a Powerful task. In order to open the Informatica Workflow Manager, Please Go to the Start menu -> All Programs -> Informatica -> PowerCenter Workflow Manager. Once you click on that, following window will be opened. Once you connected successfully, the following window is displayed. If you observe the below screenshot, you can see the folders. In order to see the existing Tasks, Worklets, and Workflows or to create them please right-click on the folder and select Open from Context menu. Clicking the Open will show the following window. The following screenshot will show the list of available tools inside the Informatica Workflow Manager. Navigator: This section is will allow us to connect with the Informatica Repository services and navigate between Different Folders such as Tasks, Sessions, Worklets, and Workflows. Work space: Use this section to create Tasks, Sessions, and Workflows. Output window: In this section, You can check whether the Task or Workflow is Valid or not. To find the Errors. 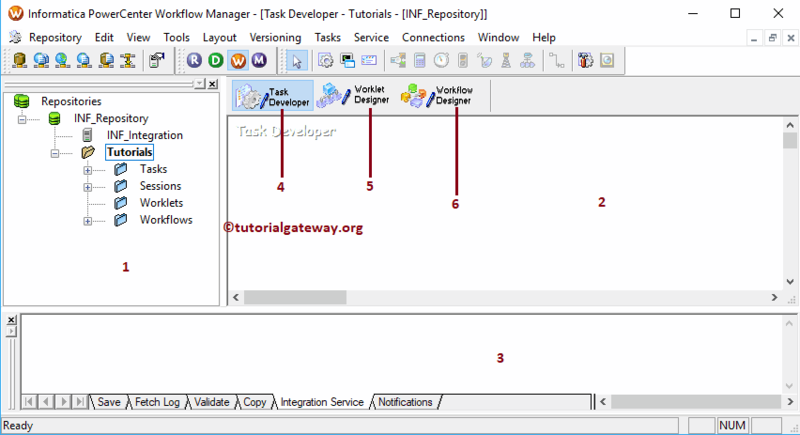 Task Developer: This allows us to create Tasks such as Session Task, Email Task etc. Workflow Designer: Using this designer you can create a workflow by connecting the tasks. We already explained the Workflows in our previous article. In order to work with any of the workflow, Sessions, Tasks, Worklets, right-click on it and select the Open from the context menu.